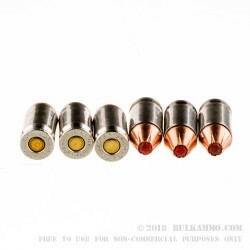 Given that .380 ACP ammo is a notoriously hard to feed and function round, this personal defense cartridge is geared towards mainstreaming the hollow point for all the newcomers on the small frame .380 market. The modified bullet design makes feeding reliability much improved, and the proven projectile design, while not perfect, is an excellent choice for the 380 Auto. 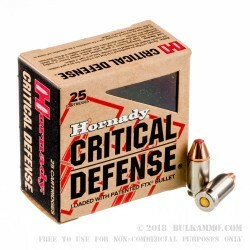 The Hornady Critical Defense ammunition line is a significant contender for any caliber, and offers excellent performance for this caliber, which has suddenly become a hugely popular round again in the past few years. The significant stopping power over smaller rounds, and the more reliable firearms being produced in .380 make a pairing with such a proven cartridge line like the Critical Defense loads a very good start for a backup gun or a first choice when you’re relying on .380. 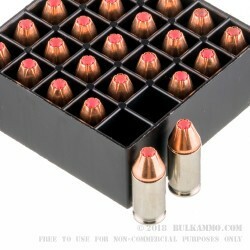 When you order this, you’ll receive a single box of Hornady 380 ammo that contains 25 rounds ready to fire. 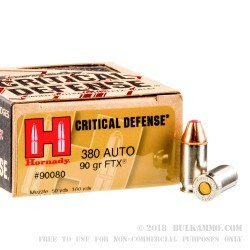 Q: What is the difference between the .380 and the 38 special Critical Defense ammo? They are both 38 caliber aren't they? A: There are many differences between .380 and .38 Special. It is important to understand that they are in no way interchangeable. .380 ACP, or .380 Auto as it is sometimes called, is used almost exclusively in semi-automatic handguns. .38 Special is used almost exclusively in revolvers. As to their caliber, while both are referred to with the number "38," the projectile diameter of the .380 is .3565" and the diameter of the .38 Special projectile is .3580", a minor but important distinction. .38 Special shares this diameter with .357 Magnum, which, again, is not the actual diameter of the projectile. However, all three (.380 Auto, .38 Special, and .357 Magnum) share the same bore diameter of .355".